Modern boxing is a fighting contest between two people who try to either knock each other out or win on points according to a set of rules commonly called the ‘Marquis of Queensbury’ rules. The fighters have to be of similar weights, are generally (though by no means always) fairly matched in terms of skill and use only punching techniques to hit their opponent. They wear certain safety gear such as boxing gloves, groin guards and gum shields, sometimes headgear is also worn especially in non-professional fights. Boxing can also be called pugilism and a boxer referred to as a pugilist. This comes from the Latin word pugil meaning a boxer. Boxing can be said to date back to ancient times as fighters have stood against each other in hand to hand combat competitions held for the entertainment of others since the earliest human civilisations. The ancient Greeks, who believed a form of fighting for the sake of sport had been invented by the gods on Mount Olympus, were known to partake in a sport akin to boxing and in 688 BCE, it was made a part of the Olympic Games. In ancient Rome the boxing scene provided a common spectator sport until eventually in around 400 CE, the Roman establishment, who by this time had adopted Christianity, abolished it as it was seen as a particularly brutal activity. Boxing is a combat sport where two people engage in a contest of strength. It is an intense sport where boxers throw punches at each other with gloves. The game is controlled by a referee, who officiates a series of one to three minute rounds depending on if they are professional or amateur fights. In Professional boxing matches they can last up to three minutes long and the bouts can last anywhere between four to thirteen rounds. The main objective in professional boxing is to win each round or get a knock out. If a boxer knocks his opponent down or hits him hard enough for the ref to instigate a ‘standing count’, he rarely loses the round. In amateur boxing the bouts are usually around three to four rounds long and only last up to two minutes. Amateur boxing can be found at events like the Olympic Games and Commonwealth Games, and the objective is to win points by landing more scoring shots on the opponents target area. 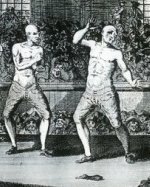 Although fistfights done for sport or entertainment undoubtedly took place throughout history, there was no real coherence or connection between bouts or fighters after boxing was banned by the Romans until in the 17th century, it saw a major revival in London. By the 1680s, matches had started to become common in Britain’s capitol city and by the turn of the century, scheduled fights were taking place at the Royal Theatre. Some of the best fighters on the boxing scene at the time would tour the country in ‘Booths’, where they would challenge anyone to go a set number of rounds with them for the entertainment of the crowd and a cash reward for the few who could manage it. When not fighting in booths, prize-fighters would go up against each other in bare knuckle fights that would have an unlimited number of rounds and would continue until someone was knocked out or unable to go on. 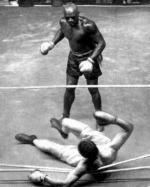 Very little skill would usually be involved in these early stages of modern pugilism history, though this changed over time as boxers came along who found ways to use tactics and brain power to overcome bigger and stronger opponents. 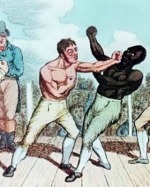 In the mid-eighteenth century, John ‘Jack’ Broughton (pictured above) became known as the Father of English Boxing after he introduced a number of rules. They were mainly concerned with the safety of the fighters and included banning hitting a man when he was down and low punches; he also introduced helmets and boxing gloves filled with horse hair, though these were just used for training purposes. 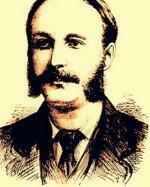 Broughton’s rules would be the only real regulation the sport had for around one hundred years until in the 19th century, the sport developed further with the introduction of the Queensbury Rules. Boxing gloves worn within the fights, three minute rounds, the ten second count and a ban on wrestling moves were all introduced making boxing recognisable as the sport that we know today. Towards the start of the 20th century, America began to take an interest in boxing and Britain’s stranglehold on the world titles began to wane. Throughout the century, new weights, rules, safety guidelines and boxing commissions have gradually been introduced and today boxing is recognised as one of the most popular sports on the planet, bringing in hundreds of millions of dollars each year and entertaining countless people in the process. Holland, G. [Internet]. 2008. History of London Boxing. The BBC. Available from: http://www.bbc.co.uk/london/content/articles/2007/11/13/early_boxing_history_feature.shtml [Accessed April 12, 2013]. Kent, G. 2009. The Little Book of Boxing. 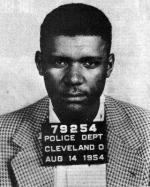 The History Press. Gloucestershire. Poliakoff, M. [Internet]. 2013. Boxing. Britannica. 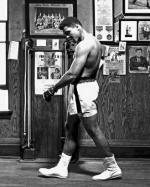 Available from: http://www.britannica.com/EBchecked/topic/76377/boxing [Accessed April 12, 2013]. The Ancient Olympics: Bridging past and present. [Internet]. 2013. The Open University. 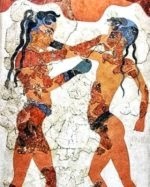 Available from: http://www.open.edu/openlearn/body-mind/health/sport-and-fitness/the-ancient-olympics-bridging-past-and-present/content-section-8.2 [Accessed April 12, 2013].